آنیلین به‌عنوان یک ترکیب سخت تجزیه‌پذیر در پساب بسیاری از صنایع وجود دارد. هدف از انجام این مطالعه تعیین کارایی فرایند شناورسازی با هوای محلول در حذف آنیلین از محیط‌های آبی بود. 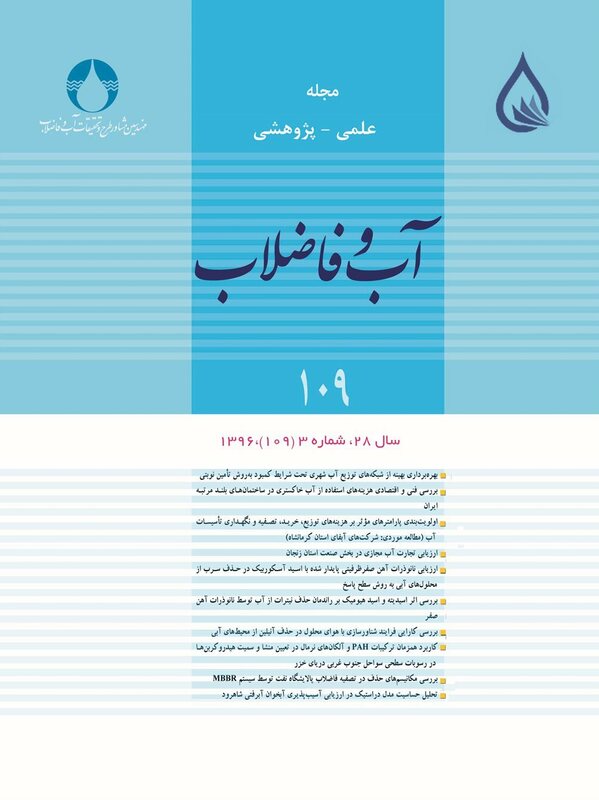 در این مطالعه کاربردی-تجربی از پایلوت شناورسازی با هوای محلول در مقیاس آزمایشگاهی استفاده شد. پس از تعیین شرایط بهینهpH و دز پلی آلومینیوم کلراید توسط آزمایش جار، تأثیر پارامترهای مؤثر در فرایند شناورسازی با هوای محلول، شامل غلظت ماده منعقدکننده (10، 20، 30، 40 و 60 میلی‌گرم در لیتر)، زمان لخته‌سازی (5، 10، 15 و 20 دقیقه)، زمان شناورسازی (5، 10، 15 و 20 ثانیه) ، فشار اشباع (3،5/3، 4 و 5/4 اتمسفر) و کدورت NTU) 60، 40، 30، 20 و 10) بر میزان کاهش پارامترهای COD و آنیلین محاسبه شد. نتایج نشان داد که فرایند شناورسازی با هوای محلول می‌تواند پارامترهایCOD و آنیلین را به‌ترتیب به میزان 6/86 درصد و 95 درصد در pH برابر 6، غلظت اولیه آنیلین معادل200 میلی‌گرم در لیتر، زمان لخته‌سازی 10 دقیقه، زمان شناورسازی 20 ثانیه، فشار اشباع 4 اتمسفر و غلظت 20 میلی‌گرم در لیتر PAC کاهش دهد. همچنین نتایج حاکی از آن بود که با افزایش کدورت در فرایند شناورسازی، راندمان حذف کاهش می‌یابد.با توجه به نتایج به‌دست آمده از این تحقیق می‌توان بیان داشت که فرایند شناورسازی با هوای محلول می‌تواند روش مؤثری برای حذف آنیلین از محیط‌های آبی باشد. Aniline is an almost undegradable compound found in many industrial effluents. It was the objective of this lab-scale applied-experimental study to determine the efficiency of the dissolved air flotation process in the removal of aniline from aquatic environments. Initially, the optimal conditions of pH and dosage of poly-aluminum chloride were determined using the jar test. The parameters involved in the dissolved air flotation process including coagulant concentration (10, 20, 30, 40, and 60 mg.l‒1), coagulation time (5, 10 , 15, and 20 min), flotation time (5, 10, 15, and 20 s), saturation pressure (3.5 / 3, 4, and 5.4 atmospheres), and turbidity (10, 20, 30, 40, and 60 NTU) on the reduction of COD and aniline were then calculated. Results showed that the dissolved air flotation process was capable of reducing COD and aniline by 86.6% and 95%, respectively (at pH = 6, an initial aniline concentration of 200 mg/ L, a coagulation time of 10 min, a flotation time of 20 s, a saturation pressure of 4 atmospheres, and a concentration of 20 mg/L PAC). It was also shown that removal efficiency declines with increasing turbidity. It may, therefore, be claimed that the dissolved air flotation process is an effective method of removing aniline from aquatic environments. Adames, C. & Josef, J., 1999, "Design and performance of physical-chemical and activated sludge treatment or an edible oil plant", Proc. of the at30th Annual Purdue Industrial Waste Conf., Purdue University, Purdue. APHA, 1993, Standard methods for examination of water and wastewaters, American Water Works Association and Water Pollution Control Federation: American Public Health Association, Washington, DC. Edzwald, J. K., 1995, "Principles and applications of dissolved air flotation", Water Science and Technology, 3(3-4), 1-23. Edzwald, J.K., Tobiason, J. E., Amato, T. & Maggi, L., 1999, "Integrating high–rate DAF technology into plant design", Journal of American Water Works Association, 91, (12), 41-53. Edzwald, J.K., Walsh, J.P., Kaminski, G. S. & Dunn, H., 1992, "Flocculation and air requirements for dissolved air flotation", Journal of American Water Works Association, 84(3), 92-100. Gomez, JL. L.G., Hidalgo, A.M., Gomez, M., Murcia, M.D. & Grinan, G., 2009, "Application of reverse osmosis to remove aniline from wastewater", Desalination, 245, 187-193. Goncharuk, V.V., Kucheruk, D.D., Kochkodan, V.M. & Badekha, V.P., 2002, "Removal of organic substances from aqueous solutions by reagent enhanced reverse osmosis", Desalination, 143(1), 45-51. Han, X.Y., Chen, S., Zhao, H., Cui, C. & Zhao, Y., 2005, “Electro chemically enhanced adsorption of aniline on activated carbon fibers", Separation and Purification Technology, 50, 365-372. Han, M. K.W. & Dockko, S., 2001, "Collision efficiency factor of bubble and particle (abp) in DAF: Theory and experimental verification", Water Science and Technology, 43(8), 139-144. Han, Y. Q.X., Chen, S., Zhao, H., Cui, C. & Zhao, Y., 2006, "Electrochemically enhanced adsorption of aniline on activated carbon fibers", Separation and Purification Technology, 50(3), 365-372. Kakavandi, B., Jafari, A., Kalantary, R., Nasseri, S., Ameri, A. & Esrafili, A., 2013, "Synthesis and properties of Fe3O4-activated carbon magnetic nanoparticles for removal of aniline from aqueous solution: Equilibrium, kinetic and thermodynamic studies", Iranian Journal of Environmental Health Science and Engineering, 10(1), 10-19. Karhu, M. L.T. & Tanskanen, J., 2014, "Enhanced DAF in breaking up oil-in-water emulsions", Separation and Purification Technology, 122, 231-241. Kawamura, S., 2000, Integrated design and operation of water treatment facilities, John Willey and Sons Inc., N.Y.
Kiuru, H., 2001, "Development of dissolved air flotation technology from the first generation to the newest (third) one (DAF) in turbulent flow condition", Wat. Sci. Tech., 43(8), 1-7. Kord Mostafapoor, F. B.E. & Kamani, H., 2010, "Survey of arsenic removal from water by coagulation and dissolve air floatation method Iran", Journal of Health and Environment, 3, 310-317. Malley, J. & Edzwald, J., 1990, "Laboratory comparison of DAF with conventional treatment", Journal of American Water Works Association, 83, 56-61. Park, J. J.Y., Han, M. & Lee, S., 2002, "Simultaneous removal of cadmium and turbidity in contaminated soil ñ washing water by DAF and electro flotation", Wat. Sci. Tech., 46(11-12), 225-230. Peavy, S.H. & Rowe, R.D., 1985, Environmental engineering, McGraw – Hill Publications, N.Y.
Rappoport, Z., 2007, The chemistry of anilines, John Wiley and Sons Ltd., London. Reali, M.A. & Cind Marchetto, M., 2001, "High–rate dissolved air flotation for water treatment", Wat. Sci. Tech., 43 (8), 43-49. Sena, R.F. T.J., Genena, A.K., Moreira, A.K., Schroder, H. & Jose, H., 2009, "Treatment of industry wastewater using dissolved air flotation and advanced oxidation processes monitored by GC-MS and LC-MS", Chemical Engineering Journal, 152, 151-157. Wu, G-Q., Zhang, X., Hui, H., Yan, J., Zhang, Q-S. & Wan, J-L., 2012, "Adsorptive removal of aniline from aqueous solution by oxygen plasma irradiated bamboo based activated carbon", Chemical Engineering Journal, 185, 201-210. Xiao, C. N.J., Yan, H., Sun, X. & Hu, J., 2009, "Biodegradation of aniline by a newly isolated Delftia sp. XYJ6", Chinese Journal of Chemical Engineering, 17, 500-505.